OK, time to do some improvisation/comping with the Samba beats you’ve learned so far. More variations – this time moving that Samba ride over to the hihat! Let’s keep rolling with some more Jazz Samba grooves, courtesy of yourmusicmuse.com. World Cup Fever! Let’s take a little Brazilian break – want to know how to samba on the drum set? Here is a great little lesson to get you started, courtesy of yourmusicmuse.com! Mark Guiliana is a guy that has been getting alot of attention as of late due to his appearances with Jojo Mayer in Sabian’s Dark Omni series. He’s a very creative player both on drumset and with electronics and has a variety of great projects to check out. This video is his Mehiliana project with Brad Mehldau. Here’s the last episode of Daniel Glass’ History of the Drumset. Part 15- The Beatles! OK, back to some learning – here’s Daniel Glass with Week 13: Rockabilly! One more diversion – Who says drummers can’t multitask? How about a big hand for drummer and Frisbee enthusiast Patrick Wilson? We interrupt the educational drumming videos – there’s been a Phil Collins sighting! He’s not playing drums but it’s still nice to see him back onstage if only for a moment or two! Week 12 and we’re in the home stretch – time to loosen up those legs and get ready for the introduction of double bass drumming! Week 10 – time for some bebop! Week 9 is all about the master himself, Mr. Gene Krupa! Week 8: Classic Big Band Drumming – now we’re cookin’! History of the Drum Set Week 7 is all about Silent Movies and the Traps that drummers used to accompany the film. Back to some more great drum set history with Daniel Glass – Week 6 is Chicago Style Drumming, circa 1919. We interrupt the informational sessions with a serious masterclass level performance from Brian Blade and The Fellowship Band. Take notes (if you can) but really just do what I do and watch this with your mouth agape. 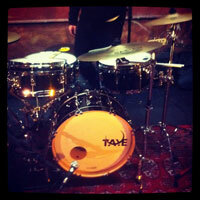 Week 5: Time to hit New Orleans and see where the modern drum set really starts to come together. OOH Week 4: It’s 1913 and brushes have just been invented! Week 3: The Bass drum pedal. Thank goodness we don’t have to use those wooden ones anymore! These are so good I’m going to link them all! Week 2 is Ragtime! Why is the drumset configured they way it is? Daniel Glass is here to help answer that question. His Century Project DVD is amazing and he’s condensed some of that knowledge into these little bites thanks to VicFirth.com. Here’s Part 1: Double drumming. Borrowed a book from my friend Steve about Tom Petty and it reminded me how much I loved Stan Lynch’s playing and those crazy enormous Tama drums he used to play. This one is from the early days of MTV and I must have seen it a million times. Hat tip to my friends at Crescent cymbals for calling this one to my attention. Elvin Jones kills a guy and then does a drum solo. Wow. From the movie Zachariah. 50 years of Beatles! Ringo is the Godfather of all rock drumming and I never get tired of hearing his playing or hearing him talk. Here’s a little snippet from Conan where he explains being a lefty(!) behind a righty kit. There’s an old (very old…) joke about how Ginger Rogers was a better dancer because she did everything that Fred Astaire did, but BACKWARDS. Along those lines, I often think of Chester Thompson who has been Phil Collins’ right hand man (literally) for 30+ years with Genesis and with Phil as a solo artist. He did all the parts that Phil recorded, backwards and then also did some double drumming live as a bonus. Chester is soooooooo underrated as a drummer and deserves more attention! So here’s to Chester and also happy belated birthday to Mr. Phil Collins (my favorite lefty!) A full live concert from 1980, compiled from bootlegs and broadcast video, where they were still doing a lot of the great older tracks. This song has the greatest drum entrance of any song I can recall. Mark Brzezicki is the Neil Peart of the Eastern Hemisphere as far as I’m concerned! How about some more percussion? You gotta love some good old latin conga work – Thank You to the Latin Cuban All Stars! Pete Lockett is a well known drummer in some parts of the world but in the US he might still be a “best kept secret.” Here’s a nice introduction to how he approaches Indian rhythms in a drum kit setting. As another year comes to a close, it’s important to remember why we make music. For our hearts, or minds and our spirits. Bring love and joy to all and have a Happy New Year. Dave Elitch is a monster on the drums. He just started a series on Drumchannel.com called “What’s the DElitch?” and here he is with Elias Malin (from our old Chicago pals Kill Hannah as well as Ke$ha) doing a little double drumming. Speaking of Elvin, here’s a proper video with great audio of the trio back in 1968. Damn. OK,I Just have to do another Bonham iso. This one is for the Hobbits! Ramble on! Seriously, who, other than maybe Elvin Jones, could groove this deep while hitting this heavy? Also, the yelling!?!?! Man, my influences are showing during these iso searches, haha. Here’s Stewart Copeland’s iso track from “Next To You.” It’s funny how boingy the toms sound soloed but how great the fit in the mix. His cymbals, as always, sound prefect. One more! Closing out this month’s unintentional theme, here’s a very long 3 hours with the great (and fellow Taye Drums endorser!) Hal Blaine. Even more from “I’d Hit That.” Here’s the great Steve Smith. More from the “I’d Hit That” podcast. Here’s Mark Guiliana. I’ve become a little obsessed with the “I’d Hit That” podcast. It offers up some great longform interviews with a wide variety of drummers. It’s audio only AFAIK so these links will only have audio and still images. Here’s one from Kenny Aronoff. Here’s another video to celebrate the release of our new CD, this is an animated version of “American Martyr. I’ll toot my own horn a little bit this month since we’ve just released our new cd – here’s a great animated video from our friend David Leiberg: “Somewhere, Somebody” by Mike Mangione & The Union. Sadly, there not a lot out on the internet to choose from but maybe its because he’s the king of “meat and potatoes” drumming. No frills, no fills, Mr. Phil Rudd. Here’s another cool Rob Hirst video of him using everything on stage. That’s a percussionist! OK. So I have this thing about Australian drummers, or at least the one I grew up listening to. So August will be for the Aussies. Here’s one of my all-time faves, Jon Farriss from INXS. He had such a crazy unorthodox kit in the 80s for awhile – rototoms with coated heads, Pearl electronics and all really low and flat. He wasn’t doing that power tom kit thing and it really stood out. The great Steve Berrios passed away this last week. He’s was described by NPR as “A Walking Encyclopedia Of Rhythms” and this video only hints as his genius. Went down the youtube hole with that Live Aid post for awhile and it reminded me of how upset I was at that “Led Zeppelin” reunion set. I love Phil Collins but he should have just let Tony Thompson handle the drumming duties. Tony was on it and Phil kinda drifts in and out and messes up some stuff. I can’t post that video without getting mad so instead, I’ll post some sweet Tony Thompson studio stuff during the Power Station sessions. I’m not overstating it when I say that U2 at Live Aid might be single handedly responsible for me sticking with music all these years. Did you play in a 4th of July parade this week? I bet this guy did! I never, I repeat never, get tired of watching Brian Blade play drums. He’s the purist example of converting emotion and thought into music that exists in theis day and age. Maybe Elvin Jones is the only other guy who did it better. I was at this event in Chicago and it was amazing. I repeat, this guys has the best gig in the world. This guy has the best gig in the world in my opinion. He’s a great drummer too! Abe Laboriel Jr in this cool VF spotlight. In honor of Geminis everywhere, how about a little twin drumming? Here’s Jojo Mayer and Steve Smith via the Vic Firth website. Happy Memorial Day – work on those rolls! More of the goods from Tommy Igoe – can’t go wrong with a sweet shuffle! Here’s another cool one from Tommy Igoe – a backbeat-less RnB/latin groove! Anytime you get stuck playing the same old things, it’ nice to visit Tommy Igoe’s groove essentials DVDs. Here’s number 87, a rideless shuffle. In a few days it will be a year since the great Levon Helm passed. So glad I was able to see the last Ramble tour he did in March of 2012. Here’s one of my all time faves from “The Last Waltz”. What’s the most versatile rudiment when moving from snare drum to the full kit? Well, there’s the paradiddle, to start with. Here’s Pete Riley for Rhythm Magazine with some ideas. Time to grab a tropical beverage and warm up that blood during this chilly winter. Enjoy part 5: Bossa Nova and pop grooves. More timekeeping in part 4 – working on fills in the same time feel and double time. Now it’s getting good – Part 3: Basic Time Patterns. Stir the soup! More brush work with Peter Erskine! Part 2: Articulation. OK, back to learning! The Vic Firth website has so many resources and I just stumbled across this great series on brushwork with the great Peter Erskine. Here’s Part 1: Developing a Legato Sound. I had the chance to meet the great Omar Hakim this past weekend. His rock playing has been an inspiration since I first heard him play with Sting. And let’s not even get started about his jazz and funk skills! OK, back to learning. Professor Peter Erskine wants to talk to you about unison notes. Pay attention!